After the loud festive season we’ve all just experienced, filled with colorful presents and unholy amounts of cheese, I was really craving something… quiet. InnerSpace is a peaceful and reflective game that acts as a great palette cleanser for the beginning of another year of explosive releases bound to titillate gamers. As the skyfaring Cartographer, you are bound to explore the Inverse. It’s an impressively imaginative design that has the world folded in on its self. The horizon folds upwards and is made of landscape you’ll soon be flying over. Once you get used to the inverted globe your spinning inside of, Inner Space transforms into a simple exploration game. Not only that but very early on you’ll be able to transform from plane to submarine and explore in the deep circular blue as well. InnerSpace is divided up into chambers of various sizes and each have their own imaginative landmarks. It’s a beautiful game to drift through, gliding past ancient geometric ruins and through otherworldly valleys, but unfortunately, its impossible landscape is the only thing that holds your attention. The gameplay aspect of InnerSpace is a simple collection game. Ruins of a long lost civilization dot around the chamber, as do the demi-gods that survived it, and you are tasked with discovering their hiding spots. I had more fun simply taking in the sights than I did awkwardly trying to squeeze through difficult geography to try and find anything at the other side. The demi-gods do offer more variation, as you have to discover how it is you communicate with them, but they are unsurprisingly rarer than the artifacts you seek. There is some limited interaction with the world, like cutting ropes with your wings, but I couldn’t help thinking I would enjoy this game more as some sort of stylistic helicopter rather than a plane. Constantly moving means frequently missing points of interest, or spending a few attempts lining yourself up to enter a structure. Which such a beautiful, inverted world it’s disappointing to not be able to slow down and enjoy it. Sure, there are some sections that allow you to stop dead and examine the landscape, but these feel counterproductive to the exploration. You aren’t completely alone on your voyage through the Inverse either. There is another, a friendly submarine that is trying to unlock the secrets of the world you’re both trapped in. I found their company immensely useful during my time with InnerSpace, as they can point to your next objective, which can is incredibly difficult to find otherwise. This includes introducing new mechanics to the game, which is unfortunate, as InnerSpace could have used a more organic approach. For instance, in one early chamber, the player is meant to reactivate a powerplant or sorts, which you do by colliding with a switch. The switch does not immediately stand out from the structure and by this point, you’ve learned not to crash into the walls. It would have been more satisfying to see the potential of a switch and experiment than being told what to do by the friendly submarine. It feels like InnerSpace drew some of its inspiration from Journey, another guided, mythical adventure, but regrettably didn’t quite reach the mark. It is at once both linear and open, but while Journey clearly signposted what the player was meant to be doing at any given moment, InnerSpace leaves you to wander aimlessly. And the music of InnerSpace really lets it down, because it’s so nice, but for some reason, so often absent. I spent a lot of time in InnerSpace floating through the sky, with the chirps of my plane being the only noise. Other times when the soundtrack did begin I felt it fit well with the easy going exploration. I did have fun playing InnerSpace, and I put more time into it than I first realized. It is by no means a bad game, but it just feels like it hasn’t done what it set out to do. Balancing between a player led exploration of worlds and a game with defined objectives is a difficult act, and Inner Space just falls short. Being aware of the collectibles hidden around the chambers meant exploration for the sake of it isn’t as fulfilling, as you’ll be on the lookout for anything shiny. While the difficult to spot objectives makes trying to progress feel like a chore. InnerSpace offers a world as creative and unusual as they come. It is a delight to take shortcuts by flying straight up and feel the navigation center of your brain twist and warp as you try to come to grips with these hollow worlds. It’s just a shame that game doesn’t know how best to present the fantastic imagination on display. This first published work by Polyknight Games, like the game’s internal history, won’t be forgotten; hopefully, it can become the stepping stone for even greater things. 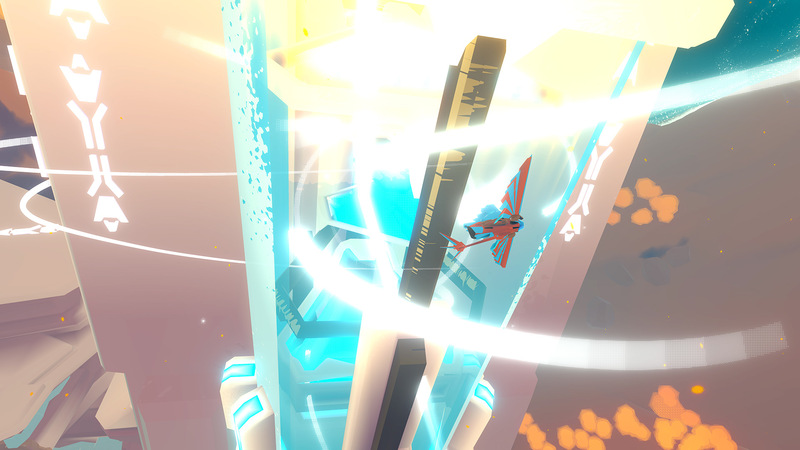 Wonderfully inventive, InnerSpace is a very interesting game. Although it is regrettably missing something to keep the players coming back, it is a lovely, gentle, and relaxing game.